Pumpkin Squares are a good use for leftover storage pumpkin. Believe it or not, two pumpkins remain in my winter storage, and here it is April. Long ago, reading New England estate inventories from the 1700s, I noticed that stored food was recorded in rooms all over a house, and not just in cellars or kitchens. Dried beans in baskets under a bed in a sleeping chamber, for example, and pumpkins and squashes in any cool, dry room. I took the hint and now store pumpkins in the upper hallway of my old farmhouse, which is not centrally heated. I see them every time I go downstairs and can monitor them for signs of spoilage and use them up before they go bad. Long Pie, an heirloom variety I plant nearly every year that looks like an overgrown orange zucchini, keeps very well. About April and May, though, I have to get serious about using any remaining pumpkins. Or else I have to cook them up and freeze them in 1- or 2-cup packages for easy use later. I like pumpkin soup, seasoned with cumin, chili and garlic, or sometimes cooked with coconut milk and Thai chili paste. Pumpkin pie is always good, even if it isn’t October or November. I’ve stirred spoonsful of cooked pumpkin into bean and barley soup where it more or less dissolves leaving behind vitamins and minerals. Then there are all those baked goods that use pumpkin such as muffins, cakes, waffles and pancakes. 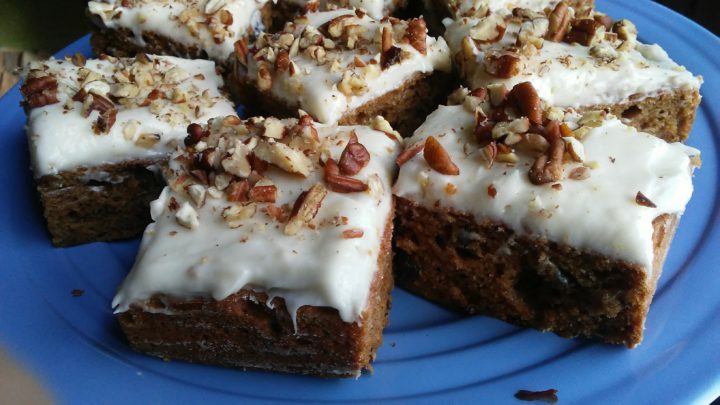 Sheila Cookson was kind enough to send along her recipe for Pumpkin Squares. 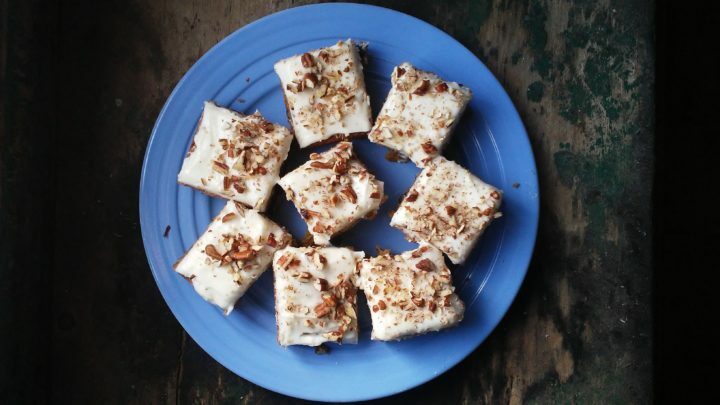 “I used to make it when my son was in grammar school, and I sent in baked goods on various occasions,” she wrote. People asked her for the recipe. I decided to give it a try. These squares are not heavily spiced. I don’t think Sheila would mind if you added more cinnamon and included ginger if you wanted. I also reduced the sugar when I made mine, but you can use the full amount if you have a sweet tooth. I hate to say it, but I would probably like anything that had cream cheese frosting on it. Use your favorite version, a simple vanilla frosting or even a sprinkle of confectioners’ sugar. Sheila considers the raisins and nuts optional. 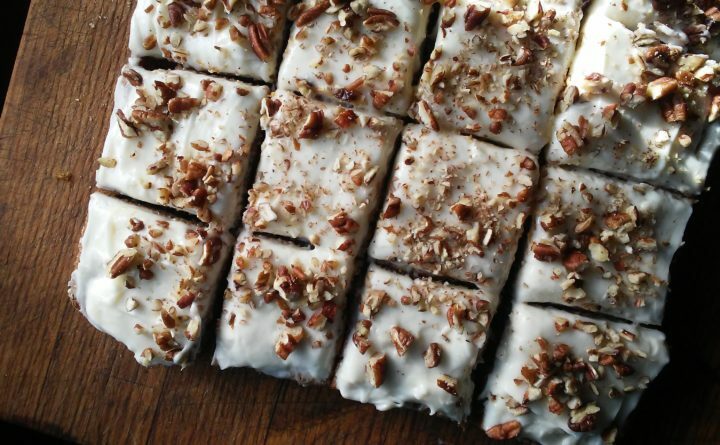 I’m not always fond of nuts in things, but pecans were a good addition to these squares. Nice, plump raisins are just the ticket. Softening raisins with hot water poured over them before adding them to the batter is the way to do it. Fans of dried cranberries could substitute those for raisins. Sheila’s recipe adds that if you halve the recipe, use a well-greased nine-inch square pan and bake for 25 minutes. I halved mine, and in my oven it took closer to 30 minutes. 1. Heat the oven to 350 degrees Fahrenheit. 2. Grease a jelly roll pan or large baking pan, or line it with parchment paper. 3. In a large bowl or mixer, beat eggs until fluffy. Add sugar, oil and pumpkin, beating gently until you have a smooth mixture. 4. Sift together flour, baking powder, baking soda, cinnamon and salt. Add it to the mixer and mix thoroughly until blended. If using, fold in the nuts and raisins. 5. Pour batter into pan and bake for 25-35 minutes, or until a tester inserted comes out clean. 6. Cool and frost with your favorite cream cheese icing or other frosting of your choice.